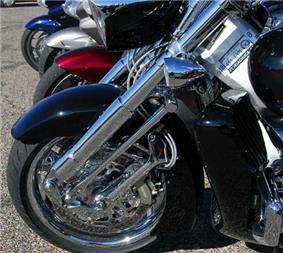 A motorcycle fork connects a motorcycle's front wheel and axle to its frame, typically via a pair of triple clamps. It typically incorporates the front suspension and front brake, and allows the front wheel to rotate about the steering axis so that the bike may be steered. Handlebars attach to the top clamp. 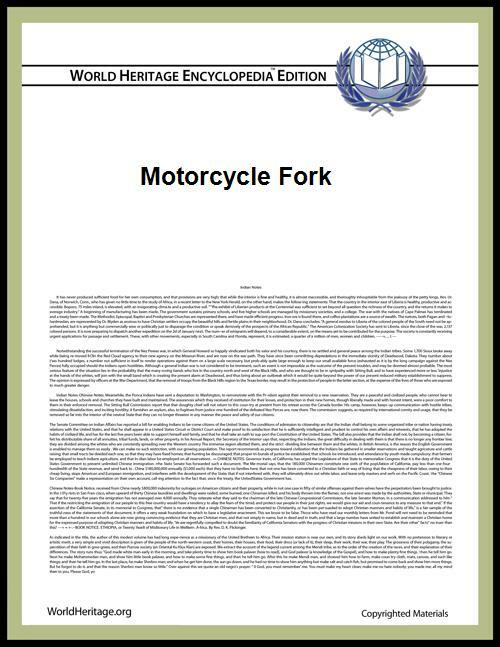 Over more than one hundred years of motorcycle development a variety of front fork arrangements have been tried, several of which remain available today. A telescopic fork uses fork tubes which contain the suspension components (coil springs and damper) internally. This is the most common form of fork commercially available. It may or may not include gaiters for protection against abrasive elements on the suspension cylinders. The main advantages of the telescopic fork are that (i) it is simple in design and relatively cheap to manufacture and assemble; (ii) it is lighter than older designs using external components and linkage systems; and (iii) it has a clean and simple appearance that bikers find attractive. Conventionally, the fork stanchions are at the top, clamped to a triple tree (also called a triple clamp or a yoke), and the sliders are at the bottom, attached to the front wheel spindle. 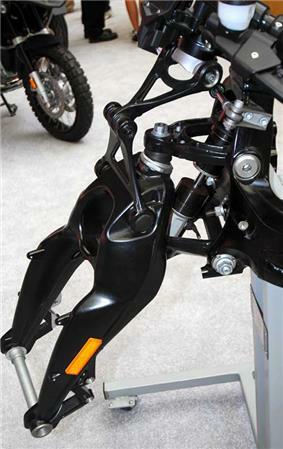 On some modern sport bikes and most off-road bikes, this system is inverted, with "sliders" (complete with the spring/damper unit) at the top, clamped to the yoke, while the stanchions are at the bottom. This is done (i) to reduce unsprung weight by having the lighter components suspended, and (ii) to improve the strength and rigidity of the assembly by having the strong large-diameter "sliders" clamped in the yokes. The inverted system is referred to as an upside-down fork, or "USD" for short. A disadvantage of this USD design is that the entire reservoir of damping oil is above the slider seal so that, if the slider seal were to leak, the oil could drain out, rendering any damping ineffective. 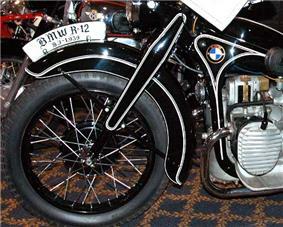 The first production motorcycles with hydraulically damped telescopic forks were the German BMW R12 and R17 in 1935. However, undamped telescopic forks were used on bikes made by The Scott Motorcycle Company from the beginning of production in 1908, and the Danish Nimbus used them from 1934 on. A trailing link fork suspends the wheel on a link (or links) with a pivot point forward of the wheel axle. 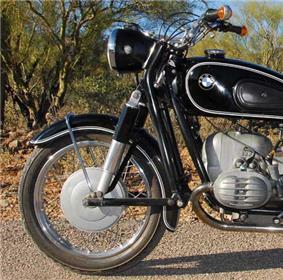 Most famously used by Indian Motocycle; it was also used by BMW for its early bikes. A leading link fork suspends the wheel on a link (or links) with a pivot point aft of the wheel axle. Russian Ural motorcycles still use leading link forks on sidecar equipped motorcycles, and aftermarket leading link forks are often installed today on motorcycles when they are outfitted with sidecars. They are also very popular with trikes, improving the handling while steering or braking. The most common example of a leading link fork is that found on the Honda Super Cub. The springer fork is an early type of leading link fork. A springer fork does not have the suspension built into the fork tubes, but instead has it mounted externally, where it may be integrated into the triple tree. This style of fork may be found on antique motorcycles or choppers, and is available today on Harley-Davidson's Softail Springer. While it may have an exposed spring near the triple clamp, a springer fork is distinguishable from a girder fork by its two parallel sets of legs. The rear is firmly fixed to the bottom triple clamp (usually brazed or welded). A short leading link holds the wheel and the forward leg which actuates the springs (usually mounted on the triple clamp). The Earles fork is a variety of leading link fork where the pivot point is behind the front wheel, which is the basis of the Earles' patent. Patented by Englishman Ernest Earles in 1953, the design is constructed of light tubing, with conventional 'shock absorbers' mounted near the front axle. The Earles fork has a very small wheelbase change under braking or under compression, unlike telescopic forks. Their construction is much stronger than teleforks, especially against lateral deflection caused by hard cornering (as when racing), or when cornering with a sidecar. 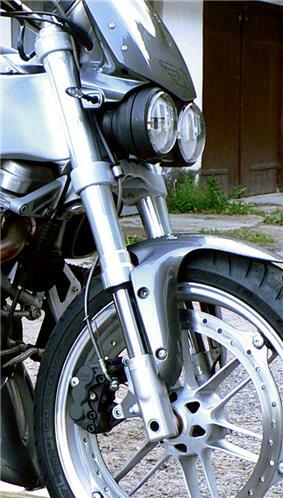 This triangulated fork causes the front end of a motorcycle to rise slightly when braking hard, as the mechanical braking forces rotate 'downward' relative to the fork's pivot point — this action can be disconcerting to riders used to telescopic forks, which have the opposite reaction to braking forces ('brake dive'). 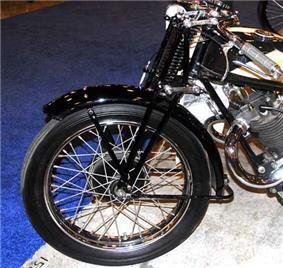 Several motorcycle manufacturers licensed the Earles patent forks for racing motorcycles in 1953, such as MV Agusta and BMW Motorcycle, while other companies (such as Douglas motorcycle) used the Earles design on their roadsters or off-road machines. 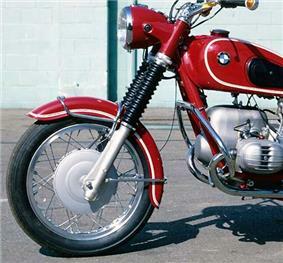 BMW is best known for their use of Earles forks, as from 1955 to 1969 they were featured on every BMW motorcycle. One of the earliest types of motorcycle front suspension, the girder fork consists of a pair of uprights attached to the triple clamp by linkages with a spring usually between the top and bottom triple clamps. The design reached its peak in the "Girdraulics" used on the Vincent motorcycle. Girdraulic forks featured forged alloy blades for extra strength and hydraulic damping. While both may have an exposed spring near the triple clamp, a girder fork is distinguishable from a springer fork by the wheel being fixed firmly to the (usually a long diamond shape) upright. The pivot points are short links mounted to the top and bottom triple clamps. The spring is (usually) mounted to the girder and compressed against the upper triple clamp. The Saxon-Motodd (marketed as Telelever by BMW) has an additional swingarm that mounts to the frame and supports the spring. This causes the trail and castor angle (rake) to increase during braking instead of decreasing as with traditional telescopic forks. In the 21st century, BMW's boxer twins are equipped with Telelever forks. The Hossack/Fior (marketed as Duolever by BMW) completely separates the suspension from steering forces. Developed by Norman Hossack and used by Claude Fior and John Britten on racebikes, Hossack described the system as a 'steered upright'. 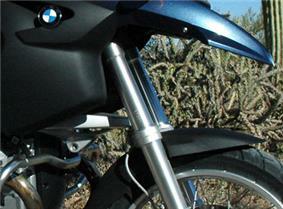 In 2004 BMW announced the K1200S with a new front suspension that appears to be based upon the design. As of 2006, the Duolever is on the K1200S, K1200R, and K1200GT. Developed by MotoCzysz for their C1 and awarded United States Patent 7111700 on September 26, 2006. It is a fork with "coaxial steering and suspension components, and having telescopic forks. Swing weight of the forks is dramatically reduced by removing their suspension components to the central location, coaxially within the steering tube. Ride height can be adjusted without loosening the forks in the triple clamps. A shock tube disposed substantially coaxially within the steering tube wherein the shock tube includes a passage therethrough substantially coaxial with the steering axis; an upper triple clamp and a lower triple clamp coupled to the shock tube; a pair of sliding-tube forks each having an upper fork tube coupled to the upper triple clamp and to the lower triple clamp, and a lower fork tube; a coil-over shock disposed within the shock tube; a front wheel rotatably coupled to the lower fork tubes; a pair of bearings rotatably coupling the shock tube to the steering tube; and a top bolt coupling the shock tube to the upper triple clamp and having a passage therethrough substantially coaxial with the steering axis; wherein the coil-over shock includes a setting adjustment mechanism which is accessible via the passages through the top bolt and the shock tube." This particular fork, as implemented on the MotoCzysz C1, also has adjustable trail, from 89 mm to 101 mm. A single-sided girder "fork" was used by the German firm Imme between 1949 and 1951. Telescopic upside down (USD) fork with stanchions at the bottom. The right fork tube can be seen held by the upper and lower triple clamp of the triple tree. 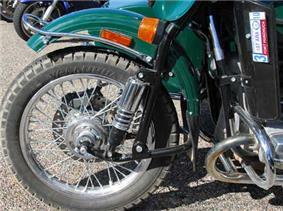 Generally employed in pairs, fork tubes (or "stanchions") link a motorcycle's front wheel to its frame. They typically house the front suspension and on telescopic fork systems compress and rebound, and may extend to adjust for inconsistencies in the road. Inside most tubes are springs, fork oil, and air, creating a shock absorber. Some forks allow pressurized air to be added through a valve in the top of the fork to stiffen the suspension. Quality forks have a flexible air tube between both fork tubes in order to balance the air pressure in both forks. Modern fork tubes have a method which employs a screw to compress fork spring to increase or decrease spring pre-load. Most modern forks also are suspended on springs and control fork movement by damping through adjustable valving to control movement by controlling the flow of fork oil. The larger the orifice, the more free the flow and the less damped the fork. A selector atop the fork engages the desired hole size or valve and corresponding damping rate in compression, while usually the lower tube has a mechanism to control rebound (extension) damping. Cartridge forks provide regressive damping. Self-contained cartridges within the forks contain spring-covered orifices regulating fork oil flow. The springs resist low forces and thus provide high damping rates. Higher forces compress the springs, allowing more oil flow and less damping. Thus the fork is stiffer when responding to small bumps but will soften as larger ones are encountered. Single action damping is currently being manufactured, such that compression occurs in one fork tube while its partner tube controls the rebound damping. This is because the oil controlling the damping in each tube, then, has only to control one direction of damping and is therefore less aerated by it working in both directions, and it develops less heat while working, which causes a variation to the thickness of the oil, thereby adversely affecting the damping rate. A triple tree ("triple clamp" (US) or "yoke" (UK)) attaches the fork tubes to the Motorcycle frame via steering head bearings, which allow the forks to pivot from side to side, and therefore steer the motorcycle. Most bikes have upper and lower triple trees, providing two solid clamping points that keep the fork tubes parallel while also connecting the forks to the frame via the steering head bearings. With the tendency to employ fork tubes with single action damping, fork triple trees need to be reinforced more than when the forks shared both damping roles, because the rigidity of the triple trees is relied upon to distribute the forces within the forks without flex. ^ Wilson, Hugo (1993). The Ultimate Motorcycle Book. Dorling-Kindersley. p. 181. ^ Wilson, Hugo (1995). "The A-Z of Motorcycles". 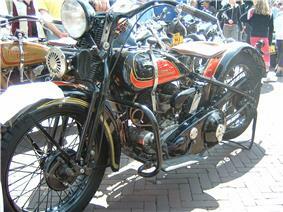 The Encyclopedia of the Motorcycle (in UK English). London: Dorling Kindersley. p. 166. ^ Duchene, Paul (May 2008). Duchene, Paul; Lombard, Stefan, eds. "Bike Buys: Nimbus–The Prince of Denmark". ^ Robert Smith (May–June 2011). "A Brief History of Girder Forks". Motorcycle Classics. Retrieved 2011-05-20. ^ Cossalter, V. "BMW Telelever and telescopic forks: which is better ?". Archived from the original on 2010-05-16. Retrieved 2012-04-07. ^ "Coaxial steering and suspension for motorcycle". Retrieved 2006-12-14. ^ "MotoCzysz". 2006. Archived from the original on 1 December 2006. Retrieved 2006-12-14. ^ Willoughby, Vic (Third impression 1977) . "Ner-a-Car". Classic Motorcycles. Hamlyn. pp. 30–32. ^ Foale, Tony. "STEER FOR THE FUTURE". Retrieved 2006-12-09. ^ McClellan, Don. "The Bike, Yamaha USA". Archived from the original on 2007-05-28. Retrieved 2006-12-09. ^ Wilson, Hugo (1995). "The A-Z of Motorcycles". The Encyclopedia of the Motorcycle (in UK English). London: Dorling Kindersley. p. 100. ^ a b Wilson, Hugo (1995). "The Directory of Motorcycles". The Encyclopedia of the Motorcycle (in UK English). London: Dorling Kindersley. p. 241.